structures." 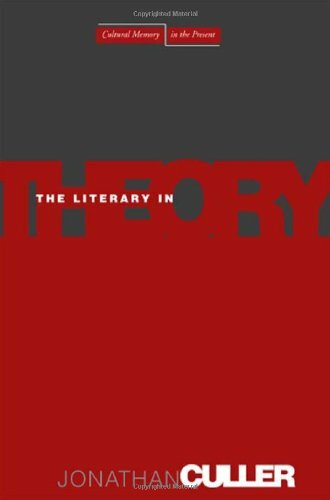 He also covers some of the background to structuralist literary theory. Interestingly, Culler also develops in this book a theory of reading that is not quite structuralist, although it does make use of a structuralist vocabulary and some structuralist ideas. The Pursuit of Signs (1981) is, the second in his trilogy of introductions to this theory. It offers explanations of poststructuralist theory, which is as much a response to as a development of structuralist theory, whose premises it frequently rejects. Just one year later, Culler published a supplement to this volume, On Deconstruction (1982), devoted not only to the work of Derrida but also to the work of American deconstructionists, who were sometimes elaborating deconstruction in more obviously political directions; for example, by generating feminist deconstructive analyses. Culler has continued to interpret Continental theory and theorists for U.S. audiences in his more recent publications. A prolific author, he has also published books about nineteenth-century French literature and culture, the field in which he did his graduate work, and books or essays on a range of other topics which he addresses from the perspective of poststructuralist theory, including puns, tourism, and trash.